Built by emperor Shah Jahan in 1631 in memory of his third wife who died during child birth, the Taj Mahal is a magnificent and well kept white marble mausoleum located in the town of Agra in India, and is considered a world heritage site. The Taj Mahal is a stunning example of Mughal architecture that utilizes a style combining elements of Persian, Turkish and Indian architectures, and is recognized world wide as a crowning symbol of Muslim art in India. To compliment this architectural wonder, the Taj Mahal garden spans the entire distance from the gate to the front of the mausoleum and is a favorite of many visitors. Indeed, for some it’s the reason for their visit. The 300 by 300 meter Taj Mahal gardens is based on geometric arrangements found in nature and combines flowers, fruits, birds, leaves, symmetry, and subtlety portraying both symbolic and abstract elements of paradise and Islamic belief. In fact, the symbolism portrayed by the garden and its geometry can even be found in Islamic texts. The four rivers of paradise depicted within the garden are water, milk, honey and wine. A magnificent raised marble lotus-tank contains a stunning reflecting pool. Within its mirror like waters can be seen the sparkling white image of the mausoleum in all its grace and beauty. One could spend an entire day watching the colors change in the reflecting pool as the sun rises and sets while losing oneself in the musical chatter of the parakeets and monkeys. The detail of the Taj Mahal gardens is incredible, and the overall symmetry and harmony are astounding. 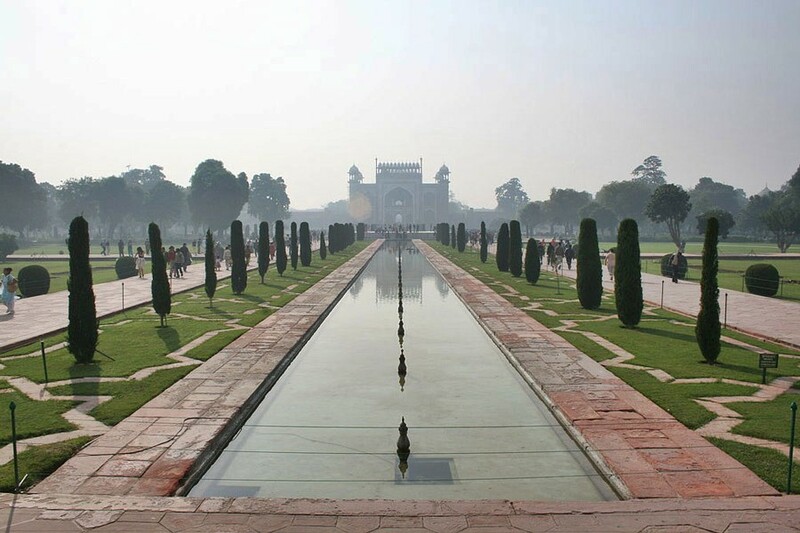 The well maintained garden is divided into four main parts with two marble canals forming the central boundaries. The symbolism of this arrangement is unmistakable as four is the holiest number in Islam. Within each quarter of the garden are planted 16 colorful flower beds each containing 400 individual plants. The flower beds are further divided by raised stone pathways placed for their symbolic meaning. Everything about the Taj Mahal gardens is spectacular. Even the two types of trees found within the garden are symbolic. The noble Cyprus trees in the garden signify death, while the various fruit bearing trees signify life, with each individual grouping of trees arranged in subtle symbolic patterns. The garden is best viewed at sunrise and sunset. To avoid the lines however, try to arrive before sunrise.